RDA in Libraries, Associations, Etc. Resource Description and Access (RDA) Information and Resources in Preparation for RDA - What is FRBR? - RDA in NACO Training for AACR2 Catalogers - Using the RDA Toolkit - BIBFRAME - Descriptive Cataloging Manual (DCM)> Conser Standard Record (CSR) - Training materials for CONSER RDA Bridge Training (Presentation Slides: Introduction / Getting Started / Identifying Manifestations / Identifying Works and Expressions / Related Works, Expressions and Manifestations / Working With Copy and When to Create a New Record ) - NACO Training - Training Manual for Applying Relationship Designators in Bibliographic Records - PCC Guidelines for the Application of Relationship Designators in NACO Authority Records (The guidelines were created by the Joint PCC Standing Committee on Standards and Standing Committee on Training Task Group on Guidelines for Relationship Designators in Authority Records. The task group members were: Bob Maxwell (chair), Chiat Naun Chew, Kelley McGrath, George Prager, Isabel Quintana, and Adam Schiff.) - FAQ – LC/PCC practice for creating NARs for persons who use pseudonyms. RDA Tools, Softwares, Services, Etc. 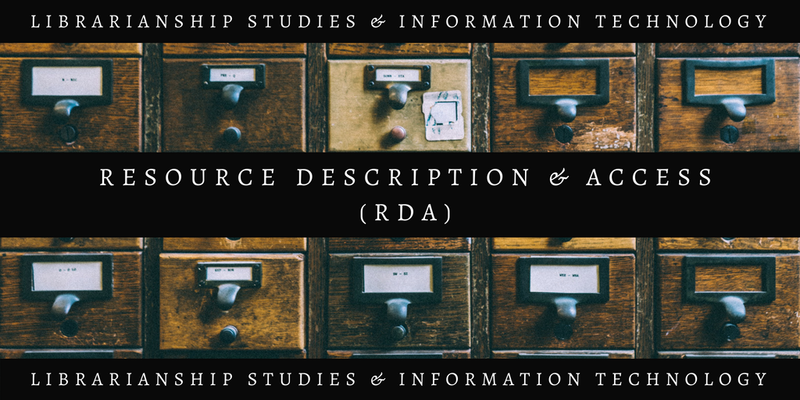 RDA Bibliography (Articles, Books, Presentations, Thesis, and Videos on Resource Description and Access (RDA)--included in "Library and Information Science Articles and News"). Help us improve this collection! Contact us with your feedback. Suggest us the RDA resources we can add to this list. You can use the comments section below, or reach us on social media.